Note: In March Christina and I spent about two weeks in Rome and Naples. A principal reason for our trip was the impending opening of the One Day in Pompeii exhibit at The Franklin Institute where we provide food services. Ours was a journey to understand the culinary context of Pompeii today and be able to present that at The Franklin Institute during the run of the exhibit. Pompeii is located in Italy’s Campania region. It sits at the base of Mt. Vesuvius, across the bay from Naples. One Day in Pompeii opens today, November 9th and will run through April 27th. I began this series of posts in Rome and there is more to come of that part of our trip. But I wanted to skip ahead to catch up with the exhibit opening. At the bottom of this post you can see the result of our trip — the menu for the VIP opening of the exhibit. 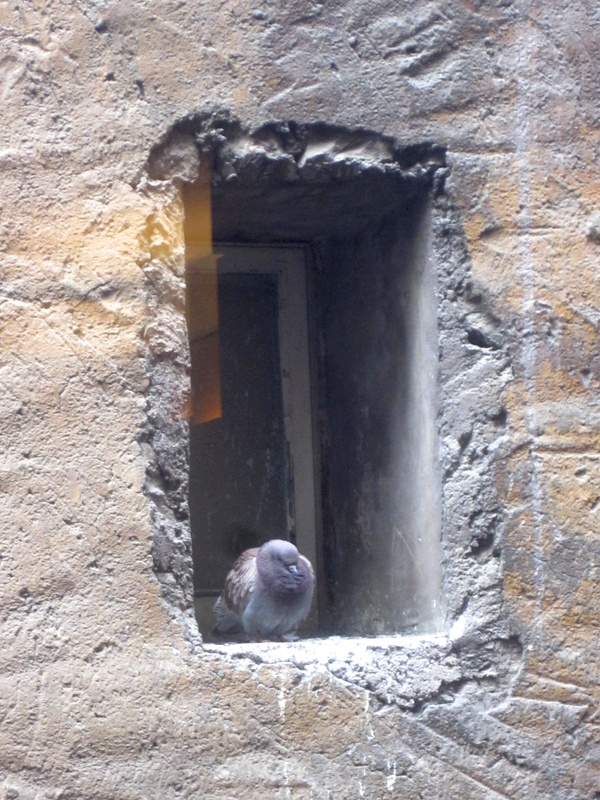 As Christina and I bid adieu to our feathered neighbor across the narrow alley from the window of our lovely Roman Hotel Raphael, we hit the road south to Naples in March with a plan to return to Rome six days hence. First, a word about driving in Italy. If you were a traveler simply visiting Philadelphia, there would be no reason to rent a car. Likewise Rome. And if your plans included travel from Philadelphia to Washington D.C. you could easily take the train. But if you were in no rush and wanted to catch the beauty and spirit of the Chesapeake, maybe with a stop for lunch along the way, then renting a car would be the way to go. Our travel plan was to punctuate our extended visit to Rome with a trip to Naples and Pompeii. Naples sits across the Bay of Naples, nearly in the shadow of Mt. Vesuvius, the volcano that rained destruction and death on Pompeii that fateful day in 79 AD. 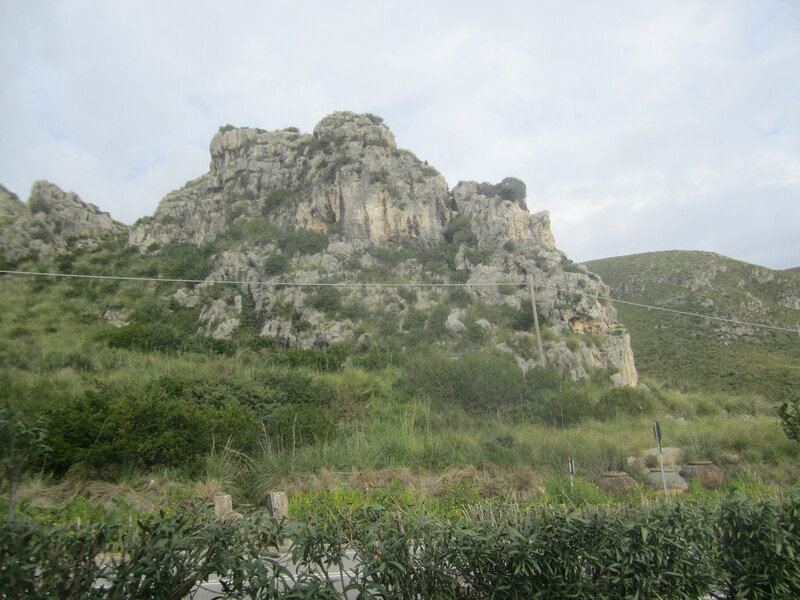 In addition, Christina had long wanted to visit Nusco, the ancestral home of her grandmother, in the mountains about two hours east of Naples. 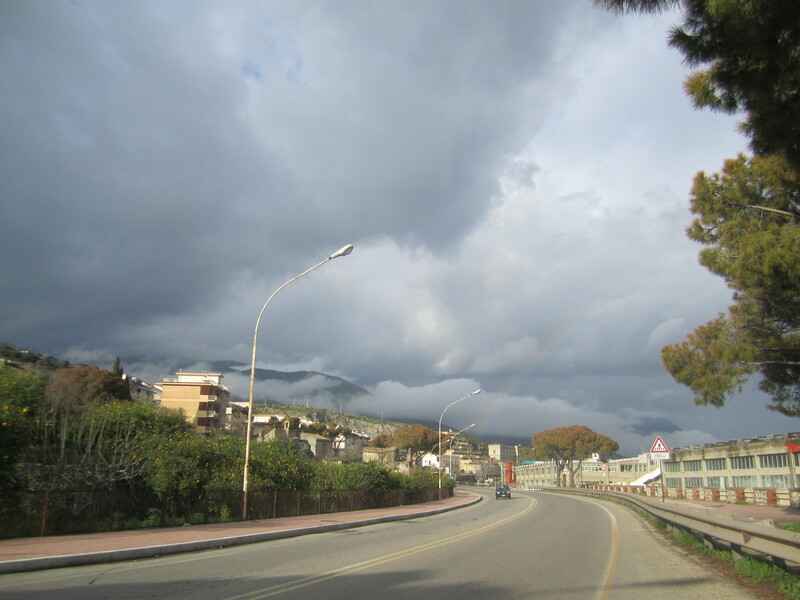 Prior to leaving for Italy, many a person had counseled me to avoid driving in Italy. Despite being a confident driver, I had modest concern about our road trip. Maybe the counsel I received was the result of their Italian driving experiences prior to the ubiquitous GPS. I found that with a GPS, driving, even within the challenging environs of Rome and Naples, was eminently manageable. Now for the trip to Naples. It is said that all roads lead to Rome. Conversely, lots of roads lead out of Rome, Italy’s largest city, to Naples, its third largest. There is the A1 autostrada that takes about 2 1/2 hours, depending on traffic out of Rome and into Naples. We took the decidedly slower — about four plus hours driving time — but more interesting route the runs mostly along the Mediterranean coast. Despite efforts to arrange to have our car rental delivered to our hotel, the pick-up of our Audi turned out to be at the airport. (There are less costly — fifty bucks to the airport, and more convenient pick-ups but that’s a long story.) We set our GPS for Naples and were off. 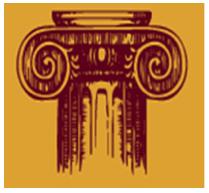 Rome itself is situated about twenty miles west and up river from its harbor city of Ostia. Ostia is Latin for “mouth” and it is the mouth of the Tiber River that links Rome to the sea. Ancient Rome’s location on hills well-inland from the sea was a strategic response to insulate itself from sea-prowling marauders. The first hour or so of our journey was interesting in a non-scenic way as it took us through the extended suburbs and exurbs of modern metropolitan Rome. 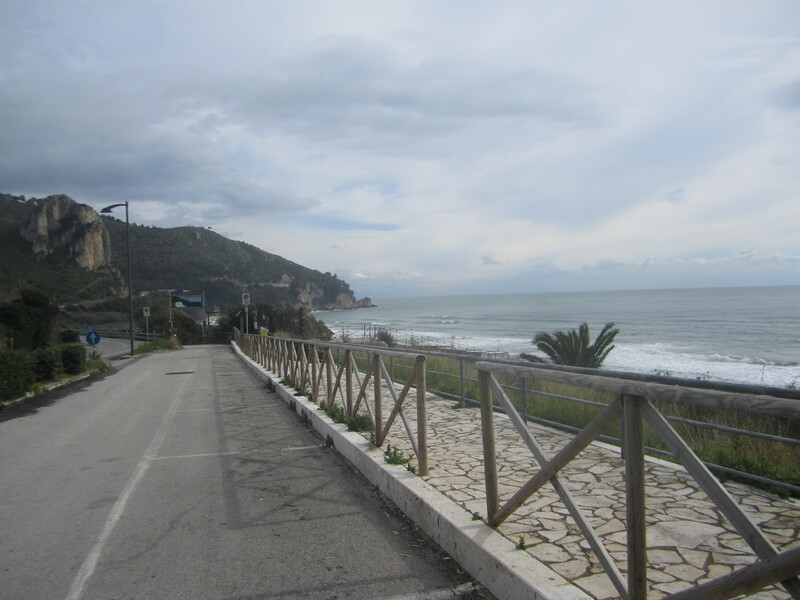 It was not until Terracine that we got our first full bore view of the Tyrrhenian Sea. I had forgotten how mountainous Italy is. Perched high about Terracina is the ancient Roman Temple of Jupiter Anxur, built in the 1st century BCE. At the time of the building of the temple, Rome had already dominated the region for four hundred years. 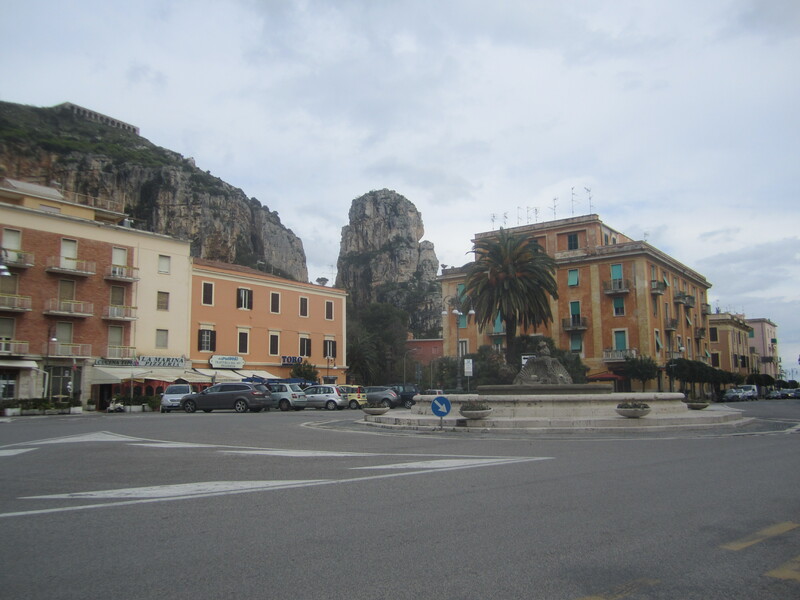 Towns like Terracina that dotted the coast moving out from Rome were integral to Rome’s “necklace” of strategic protection from hostile invaders. Italy is divided into twenty administrative regions — somewhat akin to our states. Lazio, where our journey began, is bordered on the north by Tuscany, Umbria and Marche and to the east by Abruzzo and Molise. To the south is Campania. Rome is the capital of Lazio and Naples the capital of Campania. The Tyrrhenian Sea is the body of water that separates long portions of coastal Italy from the Mediterranean. It is nestled between the west coast of Italy, and the islands of Corsica on the north, Sardina in the center and Sicily. The eastern sides of these islands sit on the Mediterranean. 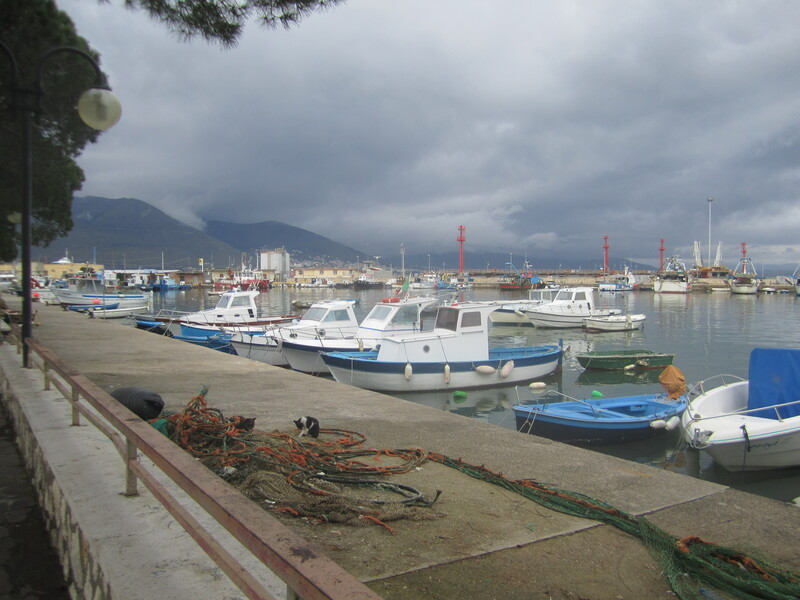 By mid-afternoon we arrived, hungry, to Gaeta, a small city that sits at the southern end of Lazio, 75 miles from Rome and 50 miles from Naples. Gaeta sits on a promontory surrounded by water on three sides and mountains on its fourth. 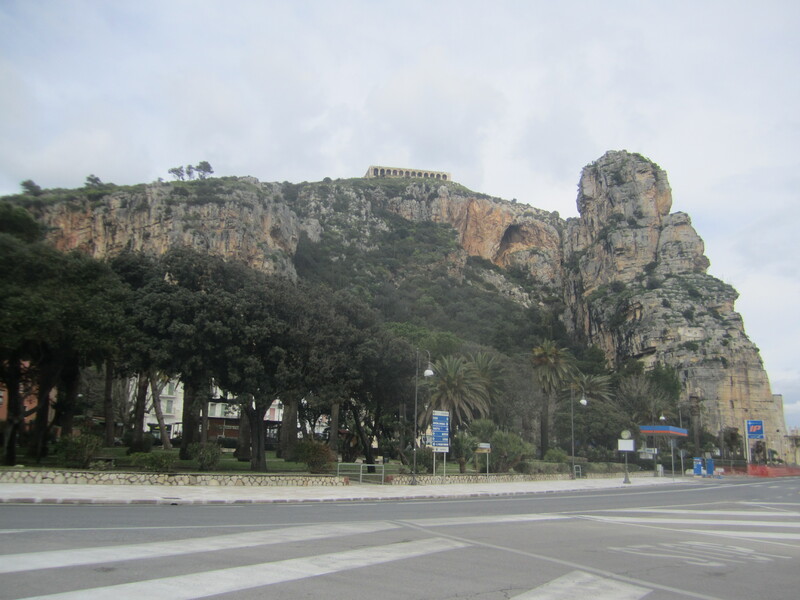 Like Terracina, Gaeta played an important military role for ancient Rome. Gaeta’s culinary distinction is that it has given its name to the small, distinctive dark, oval olives — Italy’s black pearls — cultivated in olive groves stretching out from the port city. Gaeta olives are brine-cured and have a pleasantly bitter taste. Gaeta thrives as a summer destination for Italians. In mid-March it felt nearly deserted. Absent any forethought as to where to eat, we wandered into an empty and unpretentious restaurant located along the boulevard that separates the harbor from the city. 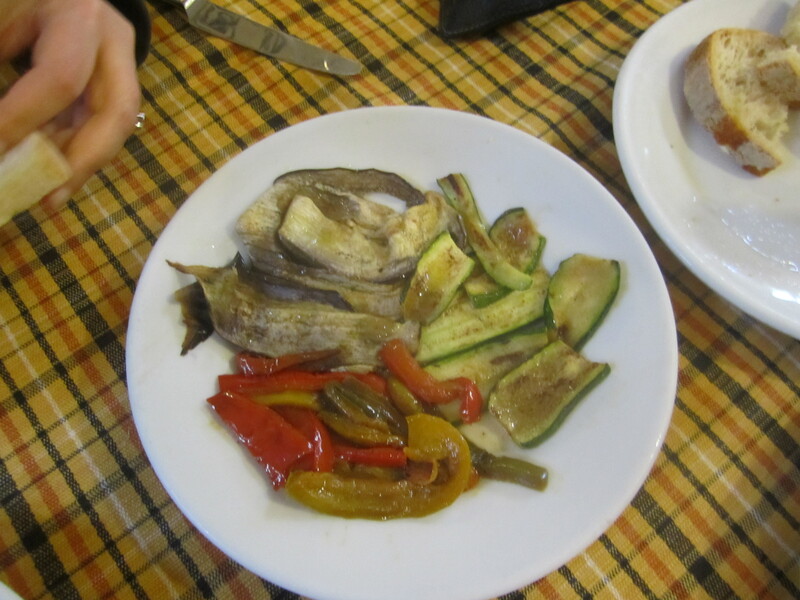 We were greeted by the proprietor who brought us a generous bowl of the eponymous olives and menus. In the distance was a lone elderly gentleman watching TV. Before long we were joined by a young Italian with skateboard in hand. He sat at the far end of long table across from a middle-aged women engaged in some sort of bookkeeping. Out of the kitchen came an older, apron-clad woman who spoke to him, naturally, in Italian. As time passed we came to understand that grandpa was watching TV, grandma was cooking, mother was doing the books, dad was our waiter and the young skateboarder, their son. 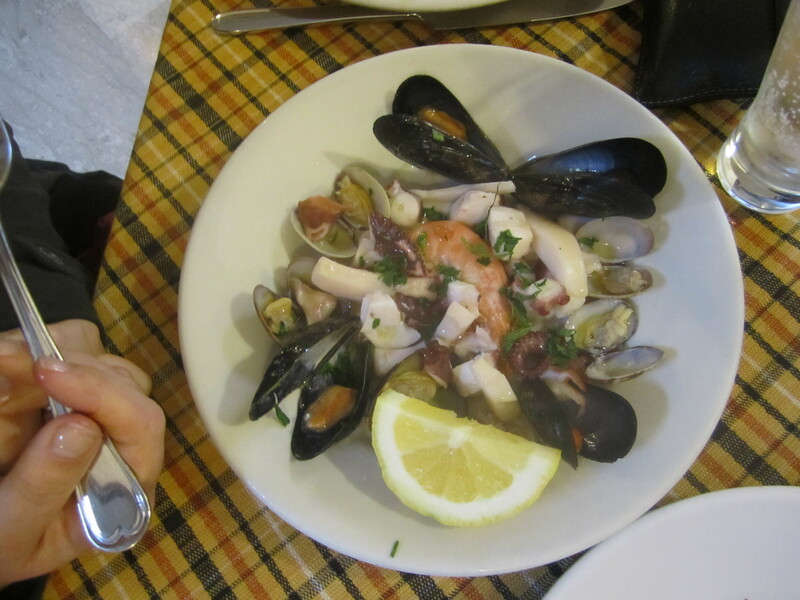 Our simple lunch included a shallow bowl of steamed seafood — mussels, clams, shrimp and squid — in a tasty broth. 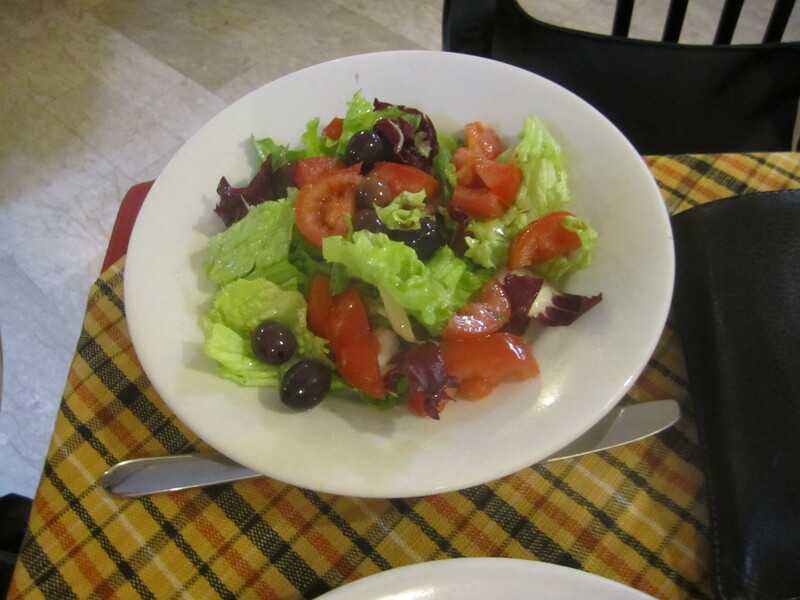 A lightly dressed salad of tender lettuce and radicchio, tomatoes, roasted peppers and, of course, Gaeta olives. 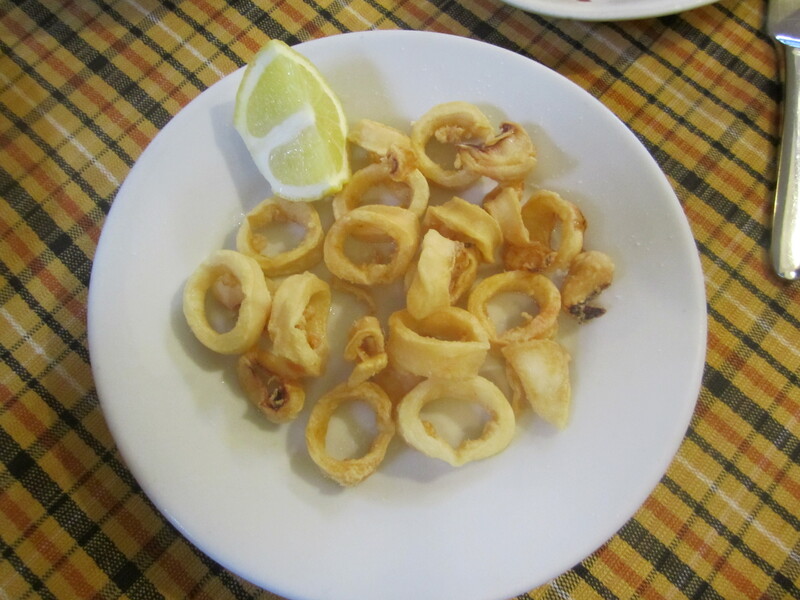 And crisp-fired calamari with a squeeze of lemon. Nothing remarkable. But totally enjoyable…especially given that we were hungry! Leaving Gaeta, the sky resembled one you might find in 14th Century Italian painting of the apocalypse. 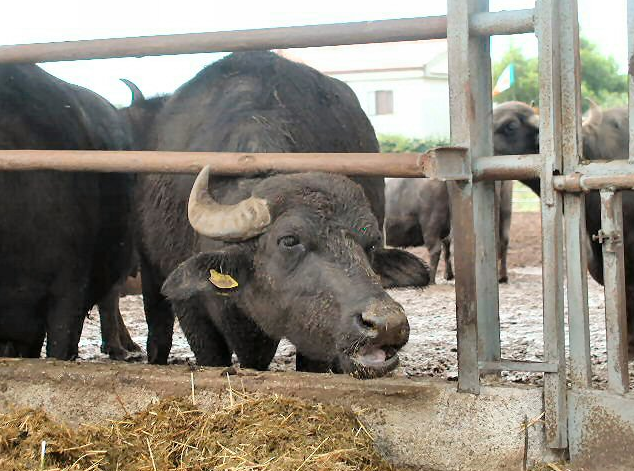 Campania is the ancestral home of buffalo mozzarella — produced from the milk of domesticated water buffalo. Compared to cow’s milk mozzarella, its flavor is not as sweet, more tangy — slightly sour — and stronger — still creamy and delicious. 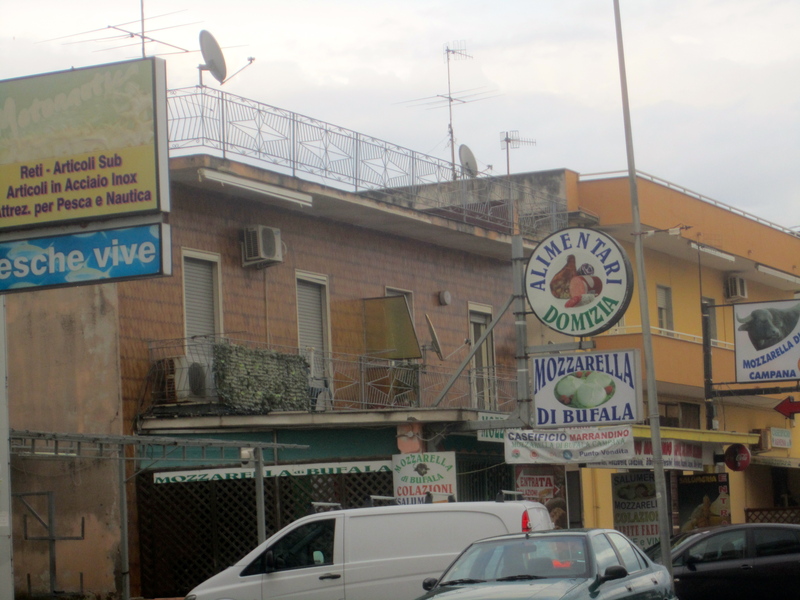 About twenty-five miles north of Naples, Madrogone is smack in the heart of buffalo mozzarella country and its streets are lined with shops proudly advertising their local culinary triumph. 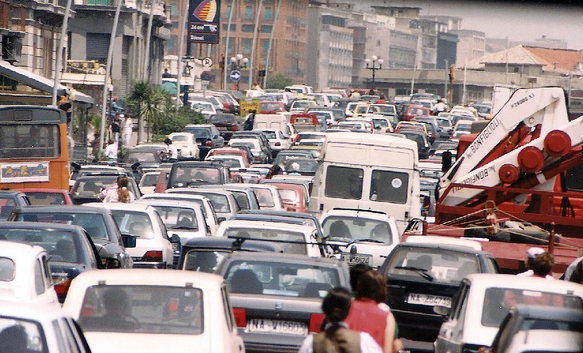 With the aid of our GPS, we arrived in Naples late in the day to a traffic jam typical of rush hour in many cities throughout the world and worked our way to our harbor-front hotel, Hotel Romeo. No Roman Legionnaires here. 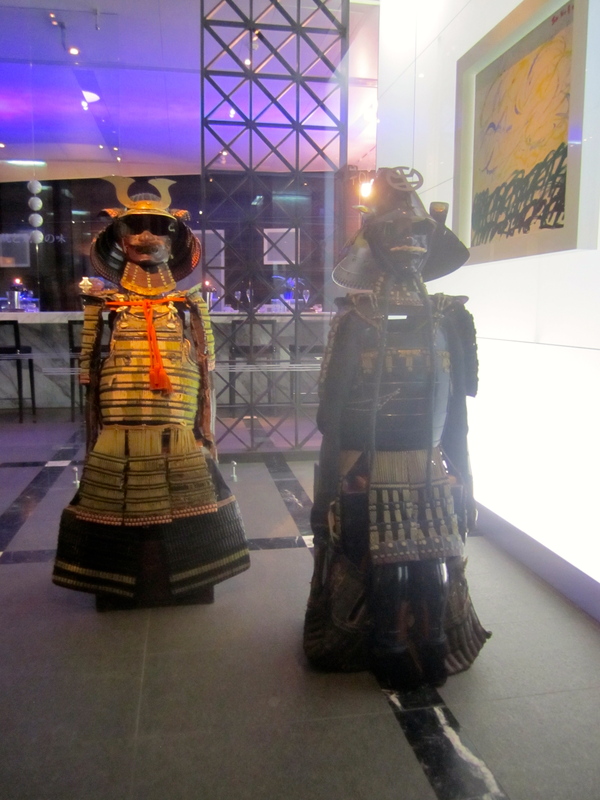 Instead, we were greeted at the hotel entrance by samurai warriors! Hotel Romeo was designed by the Pritzker Prize-winning Japanese modernist architect, Kenzo Tange and developed by his son Paul. Counted among Tange’s works of distinction is the Hiroshima Peace Memorial Park. Hotel Romeo will likely not be counted among Tange’s works of distinction. The days ahead in gritty, crowded, graffiti-covered, littered and wonderful Naples would add to the dystopian feel of our sleekly modern hotel more comfortably nested in Tokyo than Naples. More about Hotel Romeo in a future post. 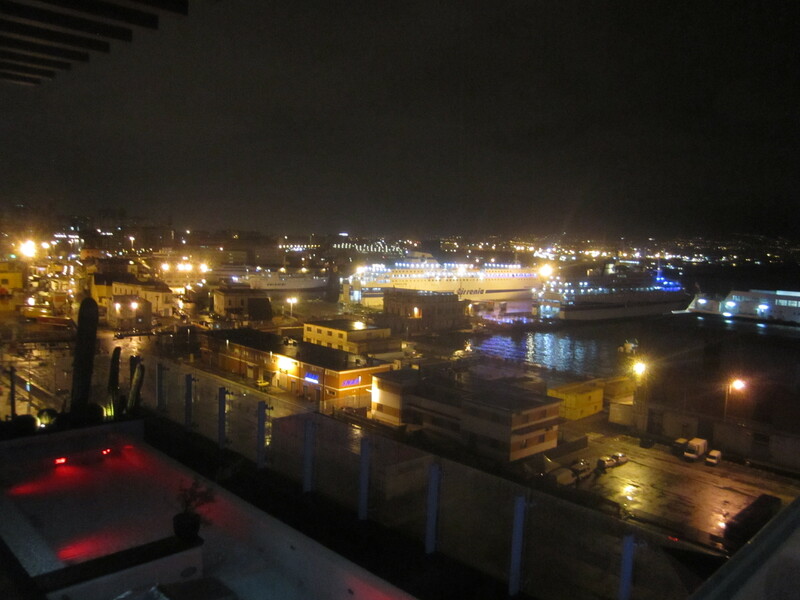 After our day-long trip, it was thrilling to arrive to our room overlooking the bustling Naples harbor and the darkness beyond. 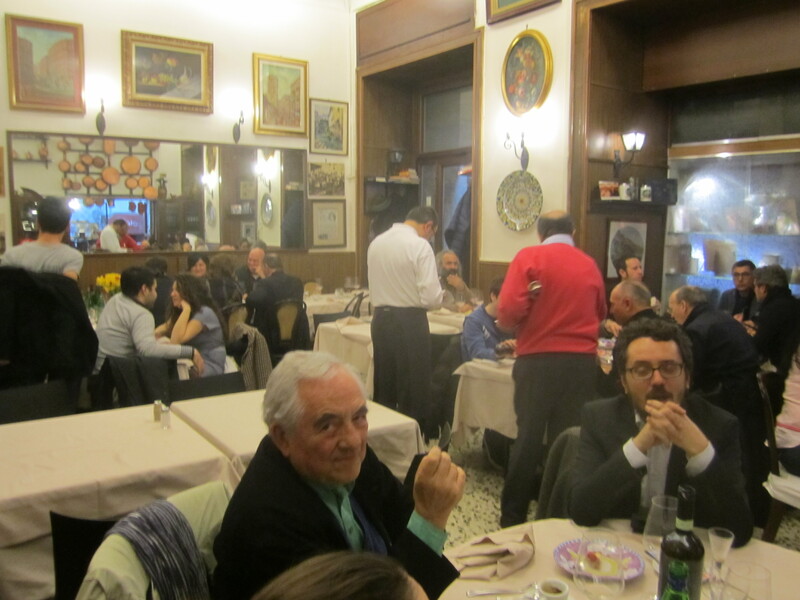 Past ready for dinner, the hotel recommended a bustling restaurant a few blocks away — Ristorante Europeo di. A. Mattozzi. While Naples gets its share of tourists, it is nothing like Rome and this restaurant would not likely find its way on to many a tourists “must-dine” locations. But it was fine in the way that it’s hard to get a bad meal in Naples. 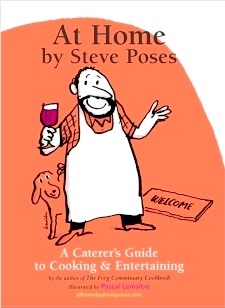 A central joy of travel is discovery, of art and architecture, history and culture…and, of course, wine and food. The universe of Italian wine is confusing with a cacophony of grapes and place names. 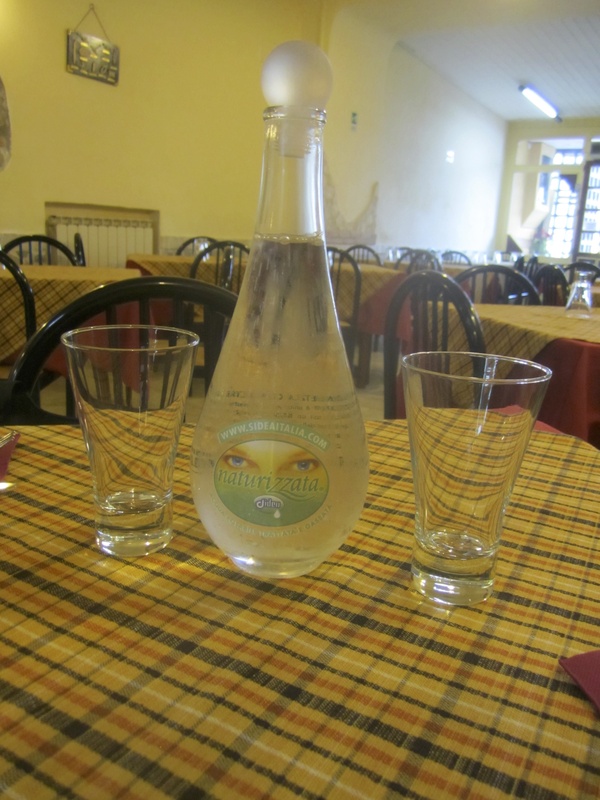 Rome has its native wines, but nothing distinctively special. Campania has a richer cellar. 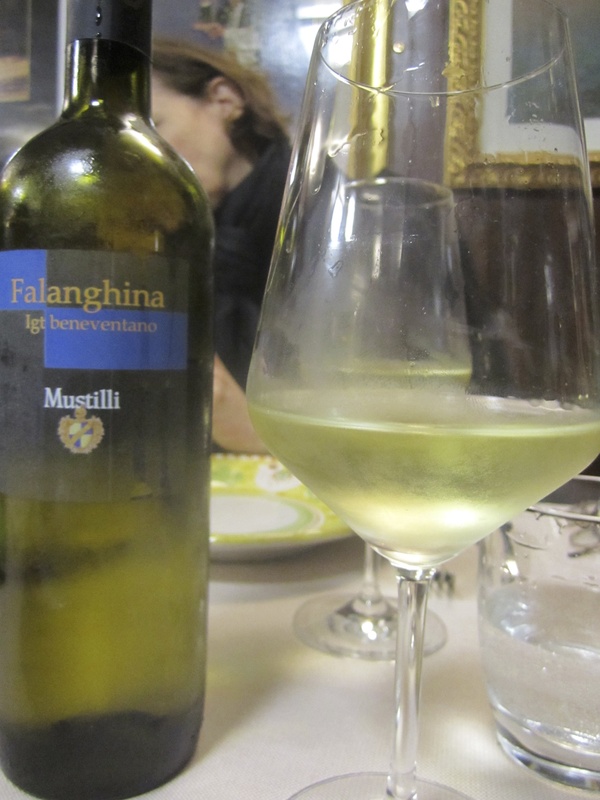 We settled in to dinner with a locally produced falanghina, named for its grape. Falanghina is an ancient grape that today produces a crisp and aromatic wine with excellent acidity and ideal accompaniment to the sea’s bounty that figures prominently in Neapolitan foods. We began with a generous antipasti of assorted salamis, meatballs, sun-dried tomatoes & a ricotta torta and a classic Insalata Caprese made with little balls of creamy, fresh local mozzarella, tomatoes and sweet lamb’s lettuce. 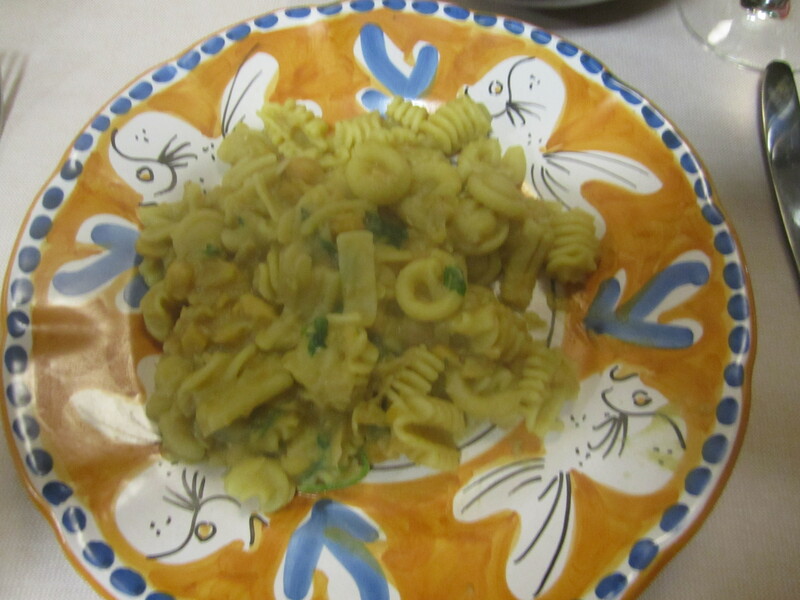 Pasta e Ceci, pictured above, included assorted shapes of dried pasta and smashed and whole chickpeas in a simple sauce made with olive oil and the cooking liquid of the chickpeas. 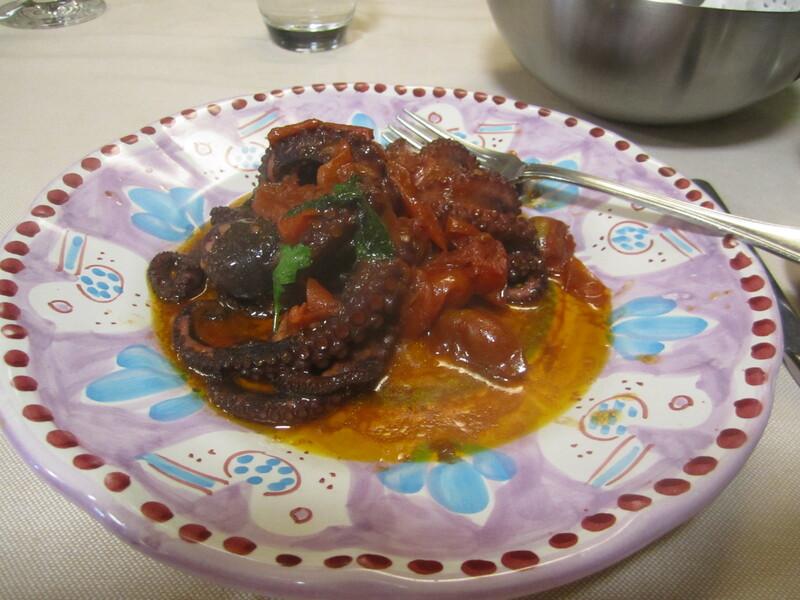 I enjoyed a hearty Polipetti affogati in cassuola — octopus stewed with tomatoes. 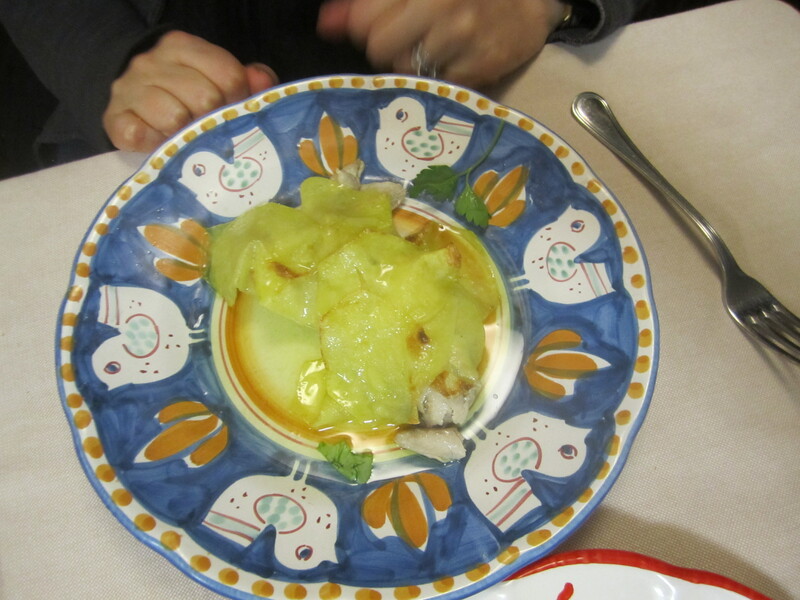 Christina took a lighter route with a simple grilled local sea bass served with thin-sliced potatoes. 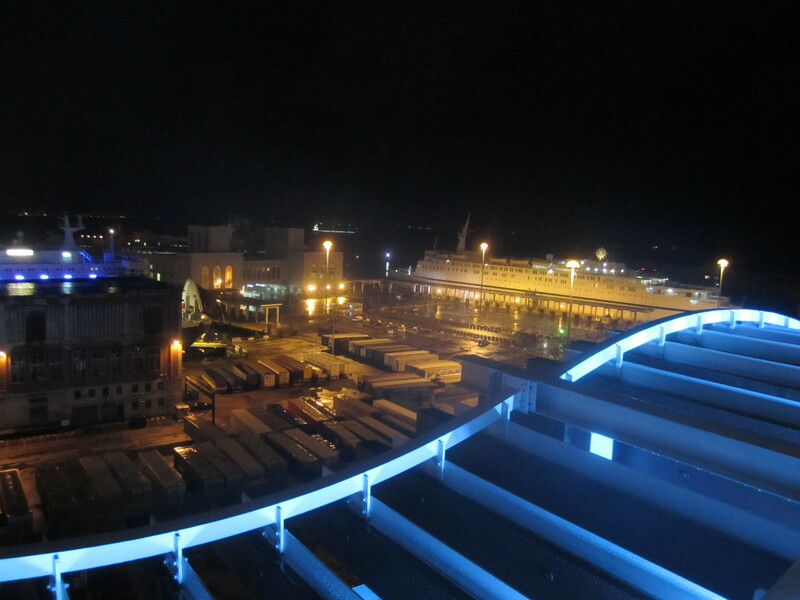 A short walk back to our hotel and a last look at Naples harbor by night before drawing the curtains and settling into a well-earned sleep. Naples awaits. The following is the menu we served Thursday evening at the VIP opening of One Day in Pompeii. Next: The Amazing Streets and Back Alleys of Naples (We’re not in Rome anymore.) Plus Pizza!